As many of you will know I like to have spinach and eggs in the morning for breakfast. A good, high protein, filling breakfast that really sets me up for the day. I heat a small bit of butter in a frying pan, add a generous portion of spinach and let that wilt down, then add three eggs. Five minutes later I’ve got my breakfast ready. Yesterday morning the routine went a little differently. I put the pan on. Added the butter. Waited for it to melt enough to slide around the pan to give it a good covering. 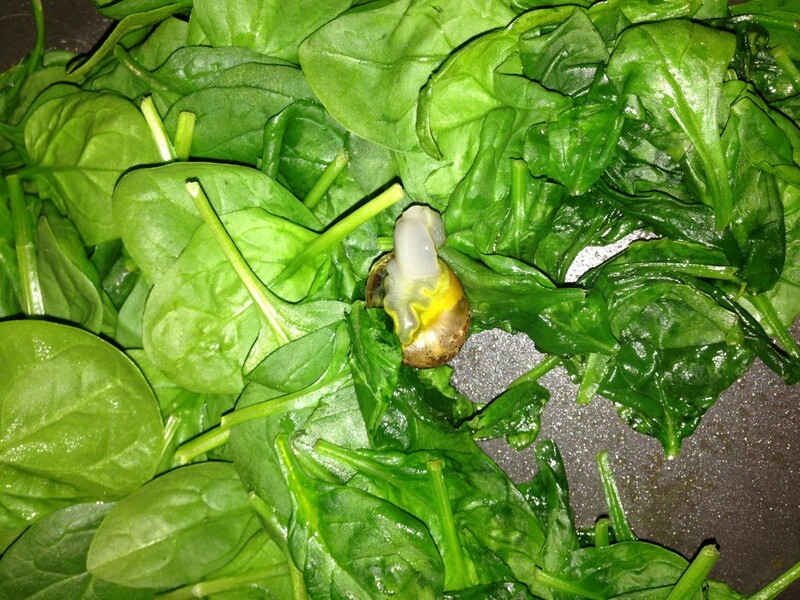 I opened and upended a packet of spinach into the hot butter, gave it a little shake and waited for the wilting. A minute or so later, I started to stir the spinach around a bit. Then I saw it. A grey, yellowish, very non-spinach looking thing in my breakfast. A snail. There was a snail in my breakfast. It was bubbling.